Struggling Charlton's winless run in the Championship extended to 11 matches following a draw at home to Blackburn. The Addicks went ahead on the half hour when Johann Berg Gudmundsson's free-kick fell to Harry Lennon, whose effort deflected past Jason Steele. But Rovers levelled on the stroke of half-time when Jordan Rhodes nodded in Adam Henley's right-wing cross. Craig Conway and Shane Duffy had headed chances for Rovers after the break while Igor Vetokele tested Steele. 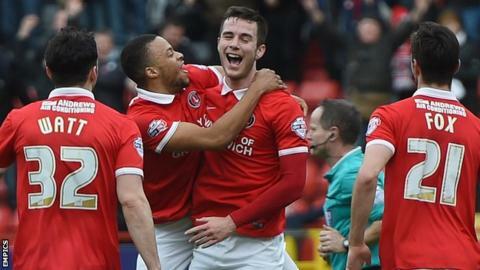 Charlton, who conceded a total of 11 goals in their two previous Championship games, remain four points from safety. Lennon's second goal for the club, and the first of Jose Riga's second spell as head coach, opened the scoring. However, Rhodes brought the away side level with his first goal in 10 league games, and Blackburn's second in seven. Rhodes was inches away from getting on the end of Hope Akpan's cross for a late winner before Steele bravely cleared with his head as Reza Ghoochannejhad looked to pounce on a loose ball. Blackburn have not won in the Championship for seven games, but Paul Lambert's side are six points above the bottom three. Addicks fans staged a protest aimed at owner Roland Duchatelet outside the boardroom at The Valley after the match. "The way the players, my squad, behaved, they worked hard to get that result. I'm happy, although I would have preferred a win. "I'm just focused on the sporting mission. Surviving is the priority and this is a tough challenge. "We receive support from the fans and that's the most important thing. "Last time as manager I found out about the fans of Charlton and they want the same as I want - to stay up." "We started the game so well. Charlton scored with their first attack of note and then we came back. "The atmosphere was waiting to turn pretty bad but that's what happens when supporters don't like what they think is happening at their club." On transfer speculation surrounding Jordan Rhodes: "It's the same situation as it was when I first came to the club. "I've not heard anything. I chat with the chief executive and until someone tells me different then it's the same situation." Match ends, Charlton Athletic 1, Blackburn Rovers 1. Second Half ends, Charlton Athletic 1, Blackburn Rovers 1. Offside, Charlton Athletic. Jordan Cousins tries a through ball, but Reza Ghoochannejhad is caught offside. Shane Duffy (Blackburn Rovers) is shown the yellow card. Reza Ghoochannejhad (Charlton Athletic) wins a free kick in the defensive half. Hand ball by Simeon Jackson (Blackburn Rovers). Adam Henley (Blackburn Rovers) wins a free kick in the defensive half. Delay in match Jason Steele (Blackburn Rovers) because of an injury. Delay in match Reza Ghoochannejhad (Charlton Athletic) because of an injury. Jason Steele (Blackburn Rovers) wins a free kick in the defensive half. Attempt saved. Jordan Rhodes (Blackburn Rovers) right footed shot from the centre of the box is saved in the centre of the goal. Assisted by Simeon Jackson with a through ball. Harry Lennon (Charlton Athletic) wins a free kick in the defensive half. Attempt missed. Corry Evans (Blackburn Rovers) left footed shot from outside the box misses to the left. Substitution, Blackburn Rovers. Darragh Lenihan replaces Hope Akpan. Attempt missed. Hope Akpan (Blackburn Rovers) left footed shot from outside the box misses to the left. Foul by Simeon Jackson (Blackburn Rovers). Corner, Blackburn Rovers. Conceded by Morgan Fox. Substitution, Blackburn Rovers. Simeon Jackson replaces Danny Graham. Substitution, Charlton Athletic. Callum Harriott replaces Zakarya Bergdich. Substitution, Charlton Athletic. Reza Ghoochannejhad replaces Igor Vetokele. Tony Watt (Charlton Athletic) wins a free kick in the defensive half. Offside, Charlton Athletic. Harry Lennon tries a through ball, but Igor Vetokele is caught offside. Attempt missed. Morgan Fox (Charlton Athletic) right footed shot from outside the box is too high. Assisted by Zakarya Bergdich. Attempt saved. Igor Vetokele (Charlton Athletic) left footed shot from the left side of the box is saved in the centre of the goal. Assisted by Johann Berg Gudmundsson with a headed pass. Attempt missed. Shane Duffy (Blackburn Rovers) left footed shot from outside the box misses to the right. Assisted by Elliott Bennett. Corner, Blackburn Rovers. Conceded by Harry Lennon.